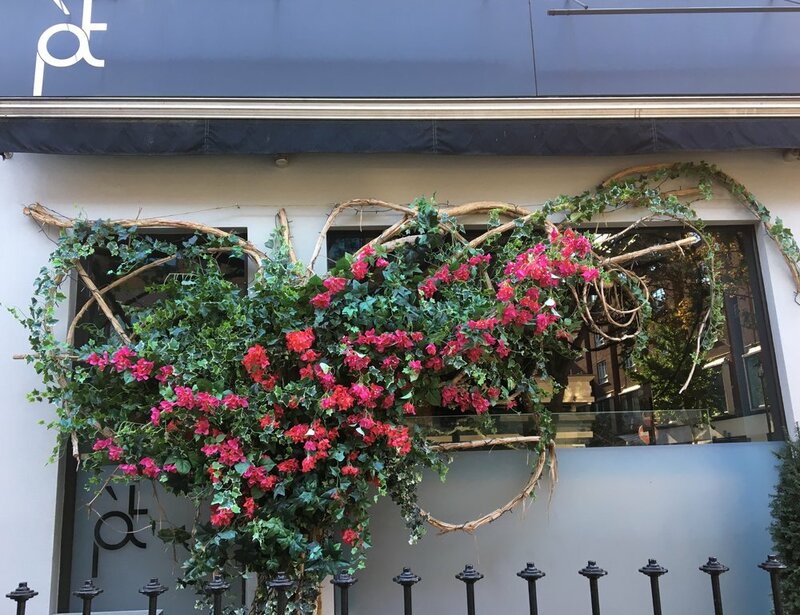 Nestled away in the heart of Fitzrovia sits Pied à Terre a delightfully French, independently owned gastronomic restaurant. David Moore, founding Director, is the creative influence behind Pied à Terre and with careful management, excellent customer service and attention to detail he has maintained Pied à Terre’s longstanding position in London’s highly competitive restaurant scene. Arriving at 7 pm on a Tuesday I was met with a warm welcome from the Sommelier who gave me the option to choose my table. They have two restaurant spaces on the ground floor one larger room towards the back, and a smaller room tucked in by the entrance. I chose the smaller room with a table in the corner, which had a great view of all the delicious meals served to fellow (very happy) diners. To begin with, an egg box, a plant pot and a pair of red lips were presented. In writing, this does sound rather peculiar, but the styling was charming and memorable! What's more, the contents of the egg box and plant pot was delicious. Inside a blown egg was Eggs Katana seasoned with wild oregano and feta cheese - the size of the blown egg provided a few small spoonfuls, which is just the amount you would want in a starter selection. On the main plate was steak tartare wrapped in a crispy roll - texture wise the roll complemented the steak tartar very nicely, and the meat was lightly seasoned. Sitting next to the spring roll steak tartar was a pair of red lips. To my surprise, the outer case was made of white chocolate and inside was very light fish mousse mixed with dill. It was a combination I had never thought of trying before but one that somehow or other worked extremely well - again I think the crunch of the white chocolate and the softness of the mousse work to complement each other. Next up was the terracotta pot with a radish planted inside in what looked like fresh soil. However, the fresh soil was in fact very finely chopped black olives. The radish was a refreshing palate cleanser to end the first course. 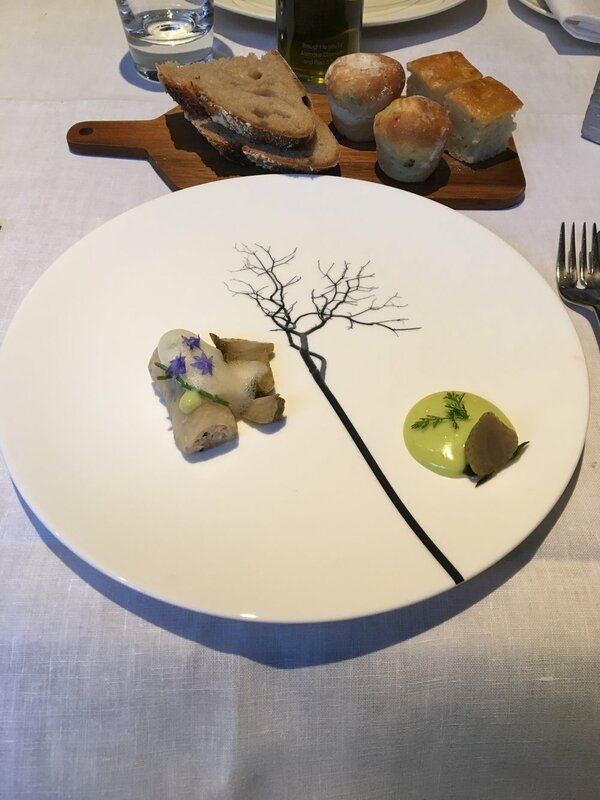 To continue with the fresh tastes the next course served was crab wrapped in white radish (Daikon) accompanied by green strawberries and a wasabi sauce and as a finishing touch, it was sprinkled with edible flowers and samphire. 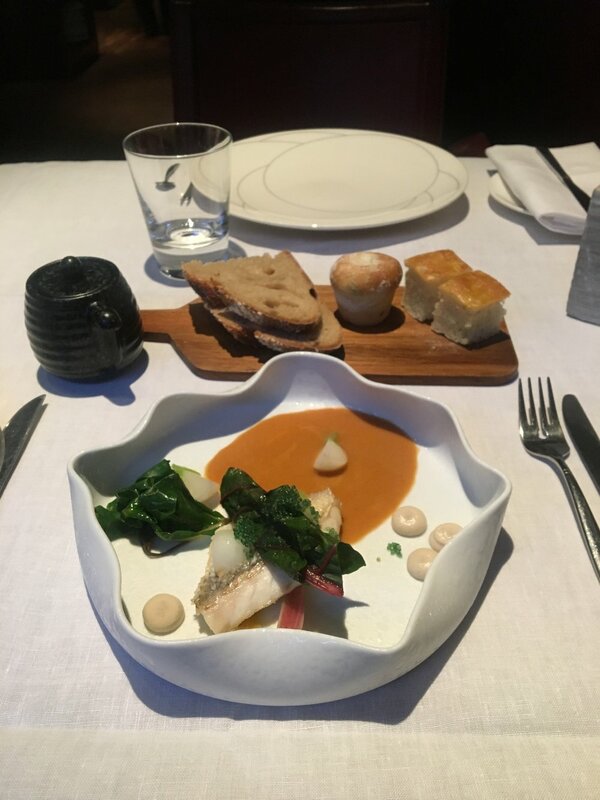 Presented in a beautiful waved edged bowl was the first main course of Sea Bass, adorned with swiss chard and fish eggs. The sea bass was cooked with scales on, that and the fish eggs gave each bite a satisfying crunch. The XO sauce gave the meal a spicy kick and an oriental twist. A change from the lighter tastes so far was the second main course, lamb cutlets. The bone of the lamb cutlet was delicately balanced on a ball of gold leaf with savoy cabbage inside and accompanied by an asparagus sword and a small grilled artichoke. Although by this time you start to feel like you are getting quite full the meal sizes are modest enough for you to maintain the number of courses and delicious enough that you forget you’re on your fourth course and pudding has not even been mentioned yet! To make the move from savoury to sweet Lemon and Yuzu curd with compressed watermelon was served on an impressive frosted cube of ice. Very refreshing and the sprinkling of dehydrated raspberry added to the tart flavour. Last but certainly not least was cherry parfait, surrounded by cherries with a side dish of ice cream. To continue the theme of encasing ingredients in each other (fish mousse in white chocolate, savoy cabbage in gold leaf) within the fresh cherries was a rich chocolate ganache. The cherry parfait and the chocolate ganache balanced each other very well. The atmosphere of Pied à Terre was warm and buzzy, especially for a Tuesday evening. 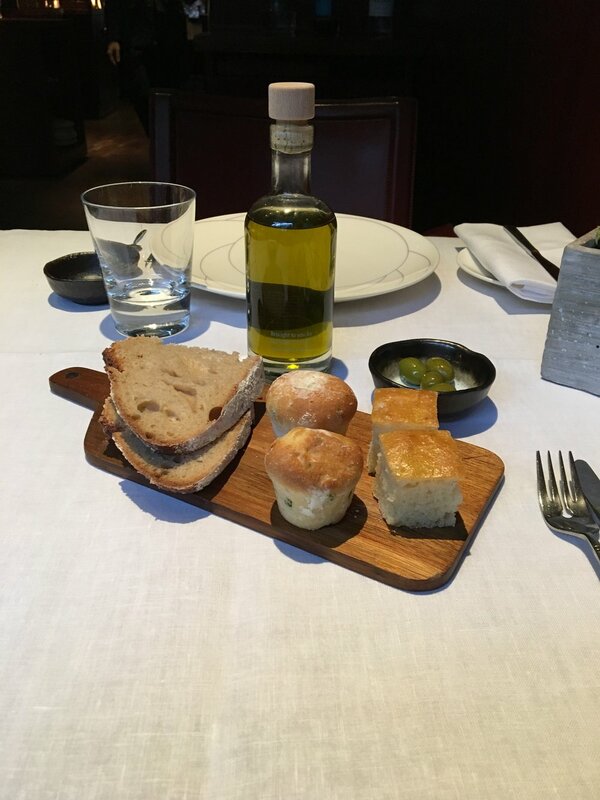 The staff were attentive and helpful, and the sommelier was particularly generous with taking the time and effort to explain the meals and the accompanying wines, this was noticeable to each table and reinforced by the great thanks that were overheard from departing diners. Overall it was a delicious and enjoyable evening.